Here I came with the very same question than for Billy Wayne or Kenny Parchman, both from Jackson (Tennessee), about how you can have just a few records issued and having a worldwide legend status since 30 years? Always the same mystery who made those Jackson's cats having worldwide recognition when they were "forgotten" in them hometown. That's a fact than many those Jackson's boys talent was overshadowed by Memphis "Sun" shine after Elvis national raise. The only one to "hit" from Jackson was Carl Perkins after Elvis had moved to RCA late 1955. Other Jackson's residents had try them luck knocking the 706 Union Avenue door but most were turned down or saw them work staying in the vaults for decades like Ramsey Kearney or Curtis Hobock. Some, like Jerry Lee Smoochy Smith or Ace Cannon, were used for session work or, like Curly Griffith, got some song writers credits on the legendary label. After the departure of Carl Perkins and Johnny Cash for "Columbia" records, Sam Phillips paid more attention to Jackson's performers, often via W.S. Holland, and issued records by Carl Mann and Rayburn Anthony. Both were performing around Jackson since years but never "made it" earlier. Back then they often rubbed shoulders with a local family band named "The Stewart Brothers". All those guys used to play at The Cotton Bowl, The Pine Ridge Club, The Hill Top, The El Rancho Club, The Chatter Box or The Delmar Inn sometime switching from a band to another. Some where real rough places, some were more supper clubs with well dressed folk but in all those places those performers could bring you hot Honky-Tonk Music or that Tennessee home bread music called now "Rockabilly". Like The Perkins Brothers, The Stewart Brothers were almost an all family band and they were "hot". Them story started in a small town named Toone located twenty miles south of Jackson and it's a very interesting one. Let me told you more about that "two room house" musical family of five brothers and six sisters. Childrens of sharecroppers, them daddy John spent countless hours and days teaching his sons to play guitar and piano. An uncle living near Bolivar (Tenn) played many instruments but favoured the fiddle performing local dances for neighbours. In 1946, three months after his last child, Frankie, was born, John was robbed and pushed in the river where he was found dead. Left with eleven childrens, Nina Dee had hard times to raise the family and most of the brothers and one sister were out of school. All the brothers, except Dewey, played instruments though they did not read music. One sister, Betty, played the guitar and piano and would occasionally sing with the brothers in some local places. When the brothers began playing as an organized band Jimmy Lee (born 1932) played lead guitar before taking care of the saxophone, Carmon (born 1935) played rhythm guitar before switching for the drums and J.D (born 1940) came on the bull fiddle bass with he had purchased from Carl Perkins's brother Clayton before moving to piano. Frankie (born 1938) soon joined on saxophone and, later, took care of the vocal and rhythm guitar. They were very versatile musicians and sometime used additional members like Buddy Doris, Jerry Jeter or Johnny Simpson. With little money coming from playing music, Carmon started Stewart's Painting Company and the other brothers went to work for him. That company is still in business today and Carmon continues to manage the business. Around 1954, the two eldest brothers, Jimmy Lee and Carmon had already established a reputation of god musician and, J.D will develop the same style of "pumping 88 keys" than Jerry Lee Lewis. They played many clubs and Honky-Tonk located in Jackson area and often backed locally Carl Perkins, Ace Cannon or Carl Mann before Frankie joined them as lead singer. For the next two years, they were the hottest dance band around and started to work them own songs from Frankie's pen. Unfortunately, they suffered of a poor management and discipline was not on them rules. Too hot to handle! In 1957, they went to "Lu" records recording studio in Jackson which was owned by Lamar Davis and Lonnie Blackwell. That label was named after Lamar's wife, Marilu. Here they recorded two songs for the label "That Long Black Train" and "I'm Not Going To Cry" released on Lu 501 under the name of Franklin Stewart and the Stewart Brothers. That first record was reviewed in Billboard, on Dec 9, 1957, as having debt to Presley and Sun. "I'm Not Going To Cry" is rated as having a potent and "That Long Black Train" as "A train blues, with typical string backing with funky sound and driving rhythm". That fabulous slice of Rockabilly who carries slight resemblance with Charlie Feather's "Raw Deal" recorded for Meteor had a heavy slap bass work and the raw Perkins guitar sound. Them record was reviewed the same week than Ricky Nelson's "Waitin' in School", Clint Miller's "Bertha Lou",Wanda Jackson's "Fujiyama Mama" and Gene Wyatt's "Lover Fever". All great songs and waxing to enjoy without moderation. Next records on "Lu", in 1958 and 1959, will feature Carl Miller, Kenny Parchman and Curtis Hobock before the label flooded. Almost overnight, the band was in such demand that the local Saturday dance show on TV signed the brothers to a six month contract allowing them to plug the night club they would be performing at that week-end. That local success leads them to leave The Jayhawks, a local roughneck joint, and to move to a local supper club who can host 300 people. They even performed once in Memphis and backed Roy Orbison there at the Overton Park Shell in 1957. They also played as far away as Cairo (IL) or Corinth (Ms), maybe at the Dixieland Jamboree. By 1959, they went to Bill Black with Jerry Jeter (bs) and Johnny Simpson (Sax/Trumpet). They re-recorded for "Hi" records "That Long Black train" and two others songs: "I Forgot To Call My Baby" and a jumped up cover of Hank Williams "You Cheating Heart". Both songs sound a bit like Carl Mann stuff with strong sax work. It's funny to note than at the same period Curtis Hobock and Jerry Lee Lewis too recorded "Your Cheating Heart" who stayed in the vaults of Sun records. Then "Hi", still a tiny label was busy with Joe Fuller, Tommy Tucker and Jay B. Lloyd and should have hold back them own release for a while. Frankie got impatient, thinking that the label was never going to release it and he went to Memphis to tell the label owner, Joe Cuoghi, to either release it or give him back the master tape. That's exactly what he does. Later "Hi" became a bigger label and here they may have miss them luck. That master tape will be used on "Dee-Jay Jamboree" records, a German label, in 1978, and bring them name to the ears of Rock and Roll nuts worldwide. An EP numbered 102 was issued with a cover picture and some biographical infos. On that record is the "Lu" recording of "That Long Black Train" and "Hi" recordings of "I Forgot To Call My Baby" and "You Cheating Heart". Them songs were also issued on various LP and CD's on "Bison Bop", "Rockhouse" or "Club" to name a few but the brothers never received any royalties for them work. Those records label could have paid them money ���cause then I spend almost $4.50 for my EP when I was earning $1.50 for each hour of work at Brest's docks. So now we got Carmon's contact and overdue royalties can be paid. Better late than never! In the 60's, The Stewart Brothers Band settled into the role of being the best Honky-Tonk dance band in Jackson and they would continue playing packed clubs like the Delta Club until late 60's. Late one night, after closing time at the famous Pine Ridge Club, a fire burned the building down the ground along with all the brothers equipment and soon after on February 5, 1968, Jimmy Lee passed away at 36 years old. Frankie, J.D and Carmon reformed the band witch now included their nephew Buddy Dorris taking care of the lead guitar and keep playing until around 1978. Frankie passed away on August 31, 1989 at 51 years old and J.D was next on October 12, 1995 being 54 years old. All the brothers are buried in the New Union Baptist Cemetery near Toone, Tennessee, leaving Carmon the only surviving brother. Carmon married Rosalie Roach in the 50's and they have four girls. One of them, Tammy Stewart Higgins was with Lorene Parchman, the corner stone for a paper published in "American Music Magazine" that month. From the pen of Jimmy Stephenson, that's only the second in deep paper ever written about that mystery band and the first to showcase great pictures from Carmon's vaults. We can only regret than "That Long Black Train" was not on the same railroad than "Mystery Train" and had not lead them to fame and fortune. Like for Kenny Parchman or Curtis Hobock, in spite of them great musical abilities, they stayed local attraction. They sure bring a lot of hot dancing music in those Honky-Tonk and Clubs but I wonder why they never made it "big". Maybe the "Sun" was not shining in Jackson? A Jackson resident, close friend of Lorene Parchman, wrote me years ago: It is funny now that I think back on those good old days, we just took the Stewart Bros for granted. They were nothing more than a local band that we all enjoyed; now I can see them very differently. 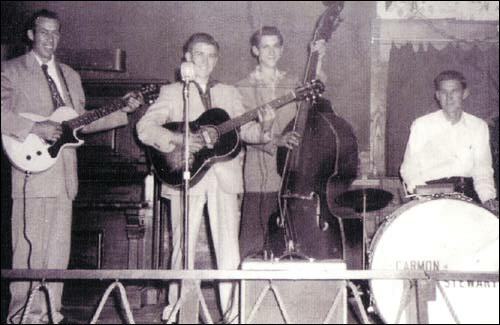 They helped to shape Rockabilly music. In September 2007, I had to send a letter to Teresa Stewart, J.D. Stewart's daughter, who doesn't understand then why people should want to know about her Daddy. I do my best to explain how her Daddy work was high rated worldwide and them record impossible to find in original pressing. Lorene Parchman, Kenny's widow, wanted the Stewart Brothers to get them recognition and have their day in the life of rockabilly history. She gave Carmon the Dee-Jay EP I had sent for him in July 2007. What a pleasure to bring back to him, from Europe, his "Long Black Train" 50 years after it was cut. You can obtain the excellent "American Music Magazine" at bo@americanmusicmagazine.com in Sweden. Don't worry about them language that feature is in American like the one about Texas legend Glenn Barber who passed away on March 28, 2008 rehearsing for "Viva Las Vegas" Rockabilly festival. Both papers are fully illustrated with rare pictures and discography. Those cats way up North, like Stomper Time records from England, gave a steady support to the Jackson's performers since years and deserve a lot of greetings. Take that long black train as soon as you can! He will ride you were the rhythm is hot and the beat strong. You gotta bop and enjoy yourself just like in the 50's. The pink and black days said Narvel Felts!